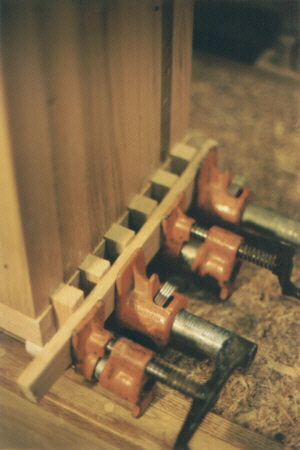 This demonstrates the method of clamping I use showing the spacers which fit in between the protruding finger joinery. This allows maximum pressure to be applied where we want it most. Alternatively, one could use soft pine blocks that would intentionally crush, thereby also applying pressure evenly.